This Python program can create new pages, edit existing pages, and upload files to an Aether blog. It doesn't require access to the filesystem, but does everything through the regular HTTP interface. Edit page in your $EDITOR. Each time the file is written, it is previewed in the browser. When you're satisfied with the results, click the "save" button in the browser. Edit a new blog entry for the blog at blogpage. Works just like the above, except for automatically choosing the number for the new blog entry. Upload localfile, optionally renaming it to remotefile (which should not contain any "/" characters, if it is specified). remotefile defaults to the basename of localfile. 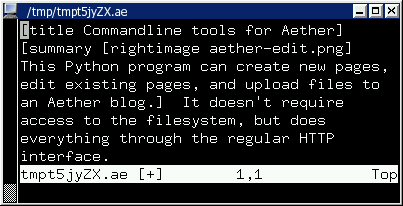 To specify the location of your aether website, use the -r (aether root) commandline option, or edit the AETHER_TOP assignment near the top of this script.